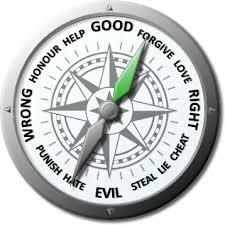 A person’s conscience is often referred to as their moral compass. In a song from the animated Disney classic Pinocchio, Jiminy Cricket instructs Pinocchio to “always let [his] conscience be [his] guide”. Initially this seems like a safe way to keep ourselves from straying from the “straight and narrow”, but if everyone’s moral compass has a different “true North”, what are we as a society to base moral decisions on? Once upon a time, people used religious teachings such as the Ten Commandments as a moral standard for behavior, but as less and less people now subscribe to a specific religion or set of beliefs, or even maintain a belief in God, we, as a society, are left with what is referred to as moral relativism. “Moral relativism is the view that ethical standards, morality, and position of right or wrong are culturally based and therefore subject to a person’s individual choice. We can all decide what is right for ourselves. You decide what’s right for you, and I’ll decide what is right for me.” (Moral Relativism) In other words, moral relativism asserts that morality is not based on any absolute standard, divinely instituted or otherwise. “Moral relativism has steadily been accepted as the primary moral philosophy of modern society, a culture that was previously governed by a “Judeo-Christian” view of morality” (Moral Relativism). But now, rather than stopping to ask “What Would Jesus Do?” choices are made based on what sounds fun or what feels good. Because if there is no God, then there is no “judgment”, and if there is no judgment, then there is no reason to put aside base desires and live a higher law, right? One example of this relativistic mind-set is found in a story of a young woman committed to sexual abstinence until marriage. Still a virgin at the age of twenty-two, a friend asked her in disbelief how it was possible that she had never “slept with anybody.” “Don’t you want to?” the friend asked. The young woman thought: “The question intrigued me, because it was so utterly beside the point. … Mere wanting is hardly a proper guide for moral conduct” (Hinlicky). If it were, think what chaos would ensue; crime rates would skyrocket because without personal moral standards to dissuade such behavior, we would have to rely entirely on governments for protection. Those who oppose moral absolutes typically do so because they believe that such morals are based on religious doctrines which they don’t accept, namely a belief in God. They believe moral relativism to be neutral because it doesn’t impose religious beliefs on others. But regardless of your belief in deity or your accountability to a god for your actions, we are all part of families and communities and societies, and as such, we each have a responsibility to those entities of which we are a part to maintain a level of order. Civilizations and the laws that govern them are built on moral absolutes. “The very act of passing a law and enforcing it suggests that there is a fixed standard that everyone is expected to adhere to.” (Moral Relativism). But “right” and “wrong” exist even when there isn’t a law in place to define and enforce it. In other words, societies need individuals who believe in moral absolutes, who hold themselves to a certain standard of morality, and expect the same from others in order to function optimally. Clearly we as a society have more freedom when we individually commit to living by absolute standards of morality. How do we cultivate moral discipline in the world around us? We can begin by practicing personal moral discipline and teaching it in our homes. “Perhaps our moral discipline, if we will cultivate it, will have an influence for good and inspire others to pursue the same course” (Christofferson). By doing so we may be able to improve our communities and protect the freedoms we enjoy.